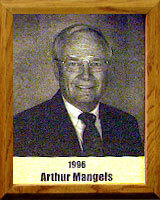 In his 28-year career at Canyon Del Oro High School, Arthur “Art” P. Mangels served as physical education teacher, head football coach and athletic director. Under his tutelage the football program had 10 winning seasons, with the 1967 squad capturing the first team state championship in CDO’s history. He also established winning traditions in wrestling and track and, during his stint as Physical Education Department head, introduced the “Adventure Sports Class” to the curriculum. Art was a three-year starter (co-captain his senior year) in football and a three-year member of the track team at Tenafly High School in New Jersey. His mile relay team won two state and three Pen Relay titles. At Blair Academy in N.J., he was on the track squad that won the National Scholastic Indoor Championship at Madison Square Garden. Art was an assistant high school football coach in Teaneck, N.J., where his team became state champions. He coached football at the University of Delaware where he received his M.Ed. ; coached football and wrestling in Prescott, AZ; and before coming to Tucson in 1964, coached football at Colorado State. He is a charter member of the Arizona Interscholastic Athletic Administrators Association and in 1990 was the state recipient of the National I.A.A.A. Award of Merit. In 1993 he was inducted into the AIAAA Hall of Fame. Art retired from education in 1992.